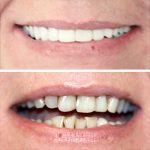 Simply Natural Dentures™ provides a unique custom arrangement of denture teeth based on patient age, desired tooth shade, masculine or feminine features and natural tissue contours. We customize every case for a comfortable, functional appliance that provides the patient with a lifelike smile embodying their individual characteristics. Simply Natural Dentures are contoured in a way that promotes self-cleansing and the appearance of natural tissue. What’s more, our processing system at Pure Dental ensures gap-free adaptation for better long-term stability. The patient has the option of choosing the size and shape of their teeth, in a characterized and personal manner.